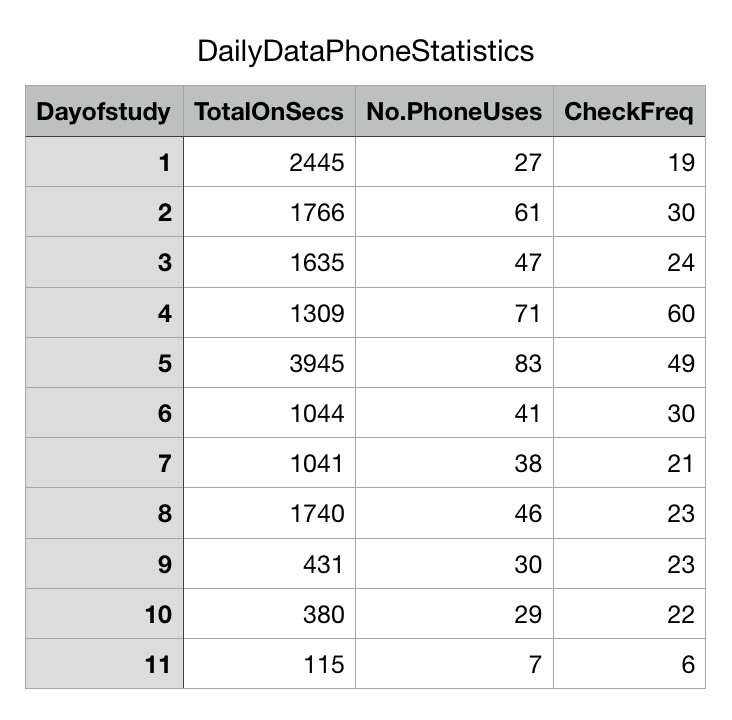 I collected data from 12 phones across 9+ days to pilot the app for my latest study (See Here!) . Participants were asked to download the app from the Google Play Store. Data is stored on participants phones and then emailed to the researcher at the end of the study. The data comes out like this: Click here to view example data! The next job is to convert this this data.txt file into a format whereby statistics can be conducted. This can be done in R and RStudio. The next part of this blog will demonstrate the processes I went through to clean and organise the data. # Empties your Environment in R Studio. Removes any previously defined variables. #Uses : and - to seperate the data into individual pieces of information. #Organises the data into variable columns, so that the first column contains the events and the second column contains the timestamps. OnOffDataClean$screenOn <- OnOffDataClean$event == " Screen on "
# Makes a new column converting time stamp to human readable data. # Examines whether there are two numbers the same as eachother in the logical numerical column, indicating a duplication. 0 = duplication. #Subsets all first instances of ON. If duplication, this subsetting ignores the second or third ON e.t.c. #Subsets all first instances of Off. If duplication, this subsetting ignores the second or third Off e.t.c. Part 4: Prepare functions. They all read the dataframe 'DurationData' and outputs statistics for a pre-defined timeframe. # -------------------------- Part 4: Prepare functions. They all read the dataframe 'DurationData' and outputs statistics for a pre-defined timeframe. Part 5: Get timestamps to input into functions. 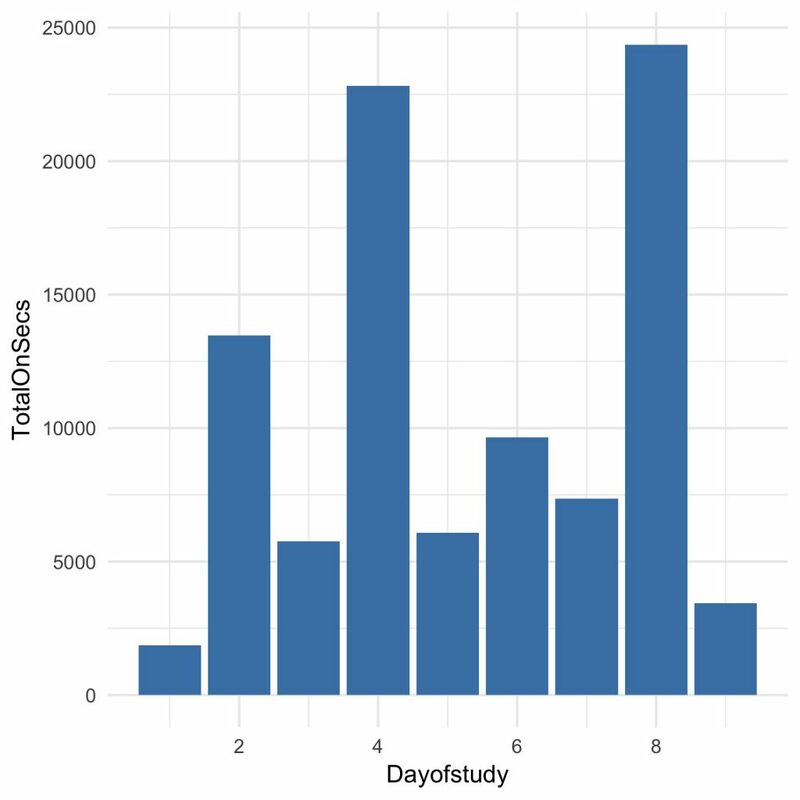 Do this by finding midnights of the particular data set to calculate daily statistics. # -------------------------- Part 5: Get timestamps to input into functions. 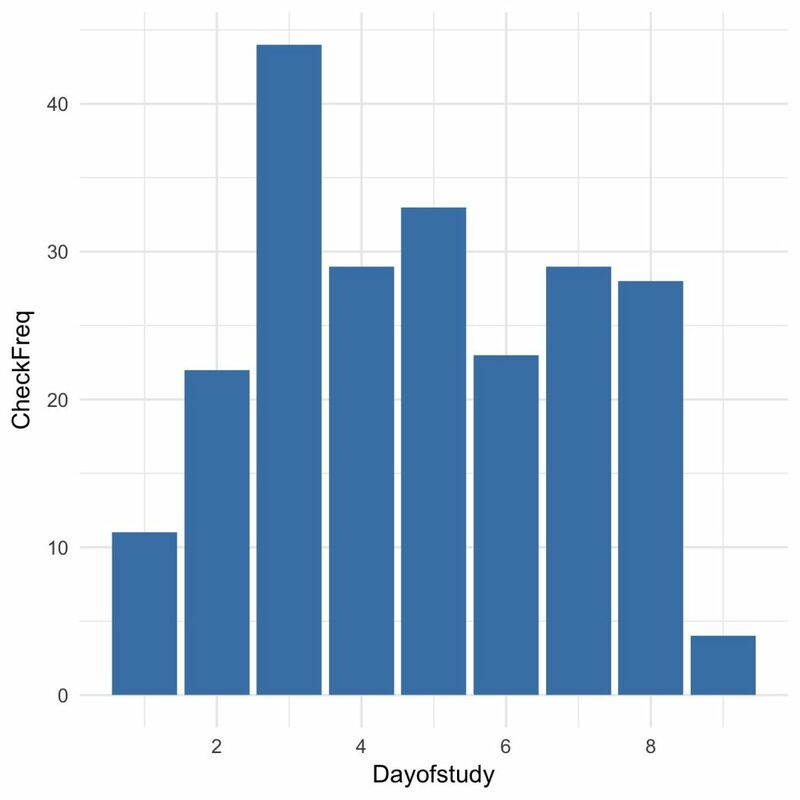 Do this by finding midnights of the particular data set to calculate daily statistics. #Get details about first time stamp. #There is probably a more efficient way to calculate this. #Get details about last time stamp. 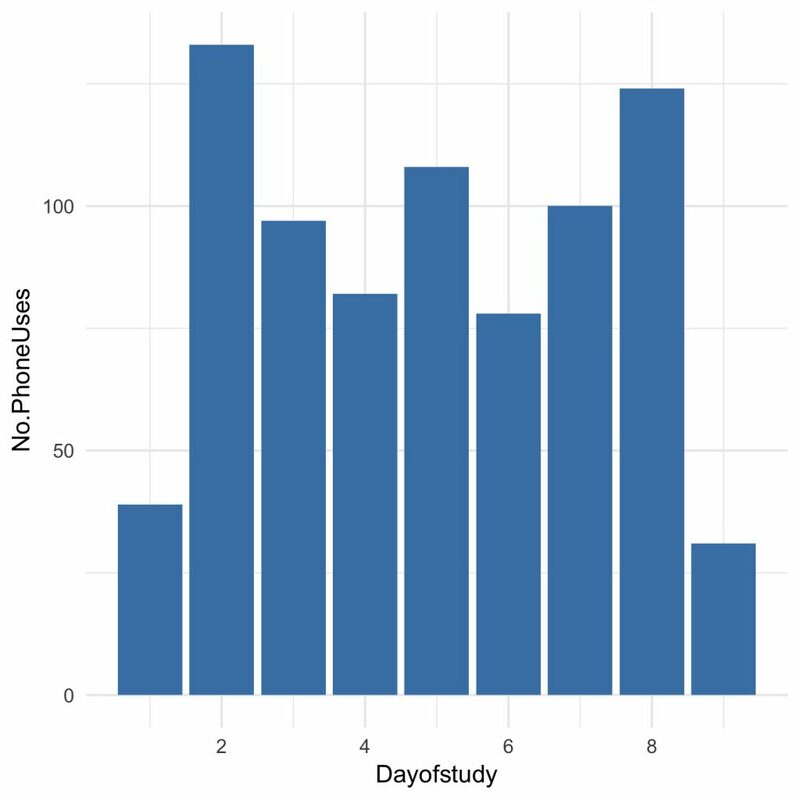 #Days across whole study, including none full days. #Make a vector which lists all the days in the study including none full days. #Daily number of uses vectors. #Put these vectors together in a dataframe. 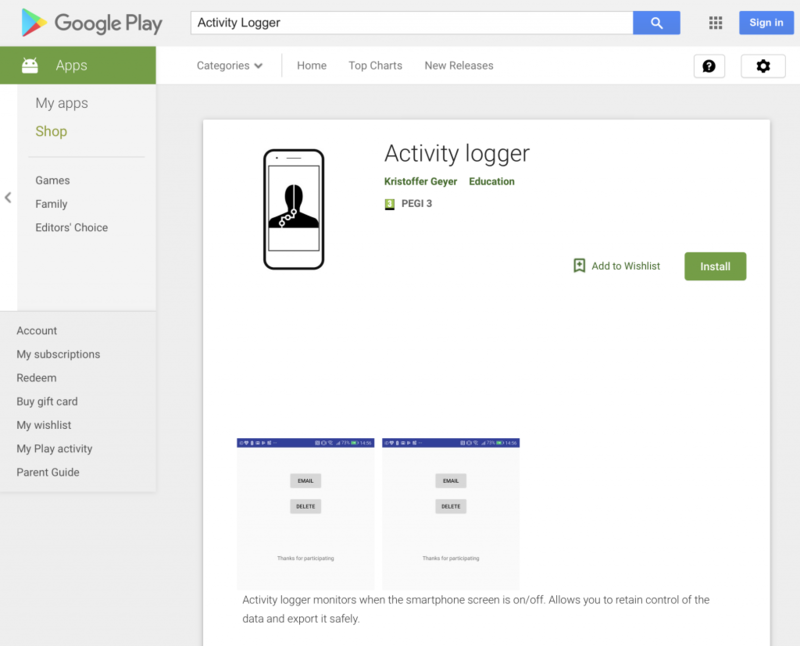 #Make sure the 'Activity Logger Data Processor' script, and your 'data.txt' file are in the same folder. #Then using R studio, click 'Session', then 'Set Working Directory' and 'Choose Directory'. Select the folder that your files are in. #Keep the name of the data.txt file. If you are wanting to change it, please also change it in the code below.